Name Variation Jacob Brenner was also known as Jake. Jacob Brenner was born in January 1870 at Russia or Germany. He was the son of (?) Brenner and Rachel (?). Jacob Brenner married Lena (?) circa 1887. Jacob Brenner died after January 1920. Jacob Brenner immigrated in 1886. [S245] U.S. Federal Census 1900 U.S. Federal Census, by Ancestry.com, ED42. Dwelling 541. [S243] U.S. Federal Census 1920 U.S. Federal Census, by Ancestry.com, ED52. Dwelling 67. Married Name circa 1887 As of circa 1887,her married name was Brenner. Lena (?) was born in April 1868 at Russia or Germany. She married Jacob Brenner, son of (?) Brenner and Rachel (? ), circa 1887. Lena (?) died after January 1920. Lena (?) immigrated in 1886. She had 6 with 4 living in 1900 children. She had 8 with 4 living in 1910 children. Sarah Brenner was born in May 1896 at Maryland or District of Columbia. She was the daughter of Jacob Brenner and Lena (?). Pearl Brenner was born in June 1897 at Maryland. Name Variation Myer Brenner was also known as Mier. 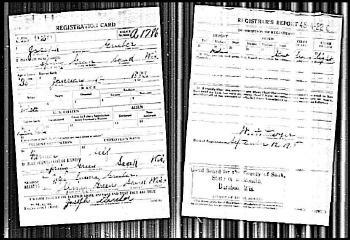 Myer Brenner was born on 28 February 1891 at Maryland also reported as 27 Feb 1891; 1900 census reported birth as Oct 1890. He was the son of Jacob Brenner and Lena (?). Myer Brenner died in July 1978 at age 87. Myer Brenner obtained US Social Security Card at District of Columbia; last residence Silver Spring, Montgomery, Maryland. On 5 June 1917 at World War I Draft Registration, Washington, District of Columbia, reported wife and child. Married Name circa 1948 As of circa 1948,her married name was Ehrlich. Mildred Margaret McIntyre married Alvin Q. Ehrlich, son of Harry Ehrlich and Dorothy Troshinsky, circa 1948 at 3rd marriage for him. Married Name after 1955 As of after 1955,her married name was Mercer. Melba Joyce Williams was born on 1 February 1927 at Texas. She married George Ivan Mercer, son of Ivan Ray Mercer and Hallie Clay Humphry, after 1955. Melba Joyce Williams died on 2 September 2018 at age 91. She was buried after 2 September 2018 at Fort Sam Houston National Cemetery, San Antonio, Bexar, Texas. Melba Joyce Williams and George Ivan Mercer lived in 2006 at 8206 Briargate Dr, San Antonio, Bexar, Texas. Name Variation Mary Kathleen Glass was also known as Kathleen. Name Variation Mary Kathleen Glass was also known as Waldon. 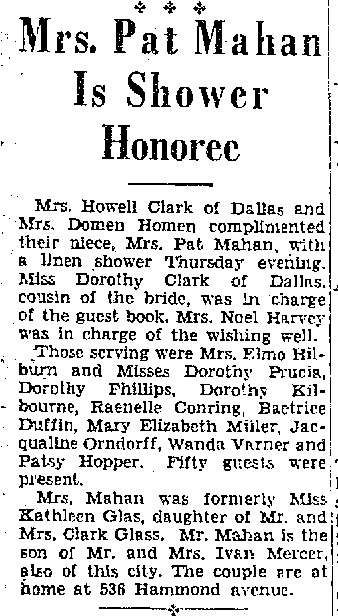 Married Name 1941 As of 1941,her married name was Mahan. Mary Kathleen Glass was born on 18 April 1924. She was the daughter of Clark Glass. Mary Kathleen Glass married Patrick Humphrey Mahan, son of Laban Albert Mahan Sr. and Hallie Clay Humphry, in 1941 at eloped Mrs. Pat Mahan (Kathleen Glass) Wedding shower. Mary Kathleen Glass died on 11 January 1996 at age 71. Name Variation Katherine Alt was also known as Catherine. Name Variation Katherine Alt was also known as Kate. Married Name circa 1900 As of circa 1900,her married name was Pletzer. Katherine Alt was born in 1877 at Germany. She married John B. Pletzer, son of John Pletzer and Margareth Ring, circa 1900. Katherine Alt died in 1915 tombstone surname listed as Pletcer. Katherine Alt had 8 with 8 living in 1910 children. [S244] U.S. Federal Census 1910 U.S. Federal Census, by Ancestry.com, ED115. Dwelling 169. 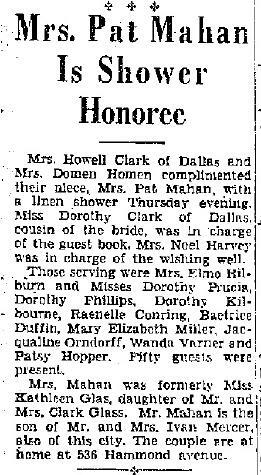 Clara Pletzer married (?) Alt. Clara Pletzer was born circa 1901 at Wisconsin. She was the daughter of John B. Pletzer and Katherine Alt. Clara Pletzer died before 1998. Name Variation Hubert Pletzer was also known as Herbert. Hubert Pletzer was born circa 1902 at Wisconsin. He was the son of John B. Pletzer and Katherine Alt. Leo J. Pletzer was born in 1903 at Wisconsin. As of 1940, Leo J. Pletzer was never married. [S373] U.S. Federal Census 1940 U.S. Federal Census, by Ancestry.com, ED56-36. Sheet 5B. Dwelling 71. Emma Pletzer was born on 17 January 1905 at Wisconsin. Emma Pletzer died on 2 April 1922 at Wales, Wisconsin, at age 17 Miss Emma Pletzer obituary. Married Name 1925 As of 1925,her married name was Pulvermacher. Hilda M. Pletzer was born on 12 February 1906 at Sauk, Wisconsin. Hilda M. Pletzer married Leo Mathew Pulvermacher, son of Michael Bernard Pulvermacher and Anna Mary Nachreiner, in 1925. Hilda M. Pletzer died on 15 February 1998 at Spring Green, Sauk, Wisconsin, at age 92 Hilda (Pletzer) Pulvermacher obituary. [S250] U.S. Federal Census 1930 U.S. Federal Census, by Ancestry.com, ED8. Dwelling 130. Name Variation Rosia Pletzer was also known as Rose. Rosia Pletzer married (?) Broderick. Rosia Pletzer was born circa 1908 at Wisconsin. Rosia Pletzer died before 1998. Mary Pletzer married (?) Young. Mary Pletzer was born circa February 1909 at Wisconsin. Mary Pletzer died before 1998. [S243] U.S. Federal Census 1920 U.S. Federal Census, by Ancestry.com, ED164. Dwelling 130. Name Variation Ray J. Pletzer was also known as Raymond. Ray J. Pletzer was born on 20 April 1910 at Wisconsin. Ray J. Pletzer died on 13 March 2000 at age 89. Ray J. Pletzer obtained US Social Security Card at Wisconsin; last residence Spring Green, Sauk, Wisconsin. He lived in 1999 at 124 East Madison St, Spring Green, Sauk, Wisconsin. Joseph M. Alt married Edith I. Phetteplace, daughter of (?) Phetteplace and unknown (?). Joseph M. Alt was born in 1902 at Wisconsin. Joseph M. Alt died in 1997. Married Name Her married name was Farris. Name Variation Anna Marie Alt was also known as Annie. Anna Marie Alt married (?) Farris. Anna Marie Alt was born circa 1905 at Wisconsin. Marcus Alt was born on 2 January 1906 at Wisconsin. Marcus Alt died in August 1961 at age 55. Marcus Alt obtained US Social Security Card at Wisconsin; last residence not specified. Married Name circa 1909 As of circa 1909,her married name was Pletzer. Stella Mary Gundlach was born on 13 December 1889 at Wisconsin. She was the daughter of Maxamilian Aegidieus Gundlach and Agnes Alda Beaver. Stella Mary Gundlach married Joseph Pletzer, son of John Pletzer and Margareth Ring, circa 1909 second marriage for him; first for her. Stella Mary Gundlach died on 24 May 1986 at age 96. Stella Mary Gundlach obtained US Social Security Card at Wisconsin; last residence Spring Green, Sauk, Wisconsin. [S245] U.S. Federal Census 1900 U.S. Federal Census, by Ancestry.com, Year: 1900; Census Place: Spring Green, Sauk, Wisconsin; Roll: 1816; Page: 5A; Enumeration District: 0145; FHL microfilm: 1241816. [S244] U.S. Federal Census 1910 U.S. Federal Census, by Ancestry.com, ED126. Dwelling 85. [S250] U.S. Federal Census 1930 U.S. Federal Census, by Ancestry.com, ED3. Dwelling 226. Donald Leo Jessop was born on 11 July 1951 at Reedsburg, Sauk, Wisconsin. He was the son of Russell Jessop and Mary E. Doyle. Donald Leo Jessop died on 13 August 2006 at age 55 Donald Leo Jessop, age 55, formerly of LaValle, died unexpectedly on Sunday, Aug. 13, 2006, in Las Vegas, Nev. He was born on July 11, 1951, in Reedsburg, the son of Mary (Doyle) and Russell Jessop. Don was raised on the family dairy farm in the Town of LaValle. He graduated from Webb High School in Reedsburg in 1969, and received a degree in agriculture from UW-Platteville in 1974. On Feb. 23, 1980, he was married to Xiomara Lacayo in Milwaukee. Don is survived by his daughters, Mary Jessop and friend (Erick Rolfson) of Pewaukee, and Janelle Jessop of West Allis; grandchildren, Giovanni and Bella of Pewaukee; stepson, Francisco (Dina) Duarte of Milwaukee; step-grandchildren, Angelica and Lorenzo of Milwaukee; sister, Patricia (Dennis) Green of Green Lake; brothers, Jerry (Jeanette) Jessop of LaValle, and Tom (Jodie) Jessop of Dalhart, Texas; half brother, Patrick (Bernice) Janecek of Friendship; former wife, Xiomara (Jorge) Reynoso of Milwaukee; many nieces, nephews, aunts, uncles, along with other relatives and friends. He was preceded in death by his parents; sister-in-law, Darla Jessop; and several aunts and uncles. A memorial service for Donald Leo Jessop will be conducted at 11 a.m., Friday, Sept. 1, 2006, at HOLY FAMILY CATHOLIC CHURCH in LaValle with Father Lorin Bowens officiating. Burial will be made in Calvary Cemetery in Reedsburg. Friends may call on Thursday, Aug. 31, 2006, from 5 p.m. - 8 p.m. at the FARBER FUNERAL HOME in Reedsburg. A Scripture service will be conducted at 7:30 p.m. Friends may also call on Friday from 10 a.m., until the time of the service at the church. The Farber Funeral Home is assisting the family with the arrangements. 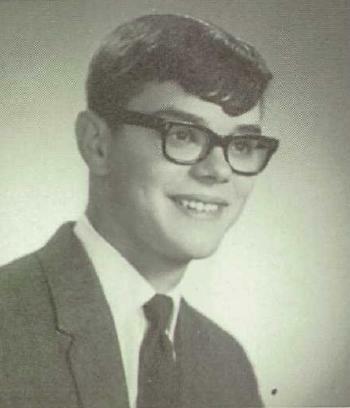 Donald Leo Jessop graduated in 1969 at Webb High School, Reedsburg, Sauk, Wisconsin. Married Name circa 1911 As of circa 1911,her married name was Brechtl. Margaret M. Gruber was born in March 1891 at Wisconsin. Margaret M. Gruber married John Baptist Brechtl, son of John Baptist Brechtl and Anna Hutter, circa 1911. Margaret M. Gruber died in 1972. [S245] U.S. Federal Census 1900 U.S. Federal Census, by Ancestry.com, Year: 1900; Census Place: Bear Creek, Sauk, Wisconsin; Roll: T623_1816; Page: 1B; Enumeration District: 129. [S250] U.S. Federal Census 1930 U.S. Federal Census, by Ancestry.com, ED13. Dwelling 91. John Baptist Brechtl was born in November 1887 at Wisconsin also reported as 1888. He was the son of John Baptist Brechtl and Anna Hutter. John Baptist Brechtl married Margaret M. Gruber, daughter of Michael Gruber and Frances Ruhland, circa 1911. John Baptist Brechtl died in 1943. [S245] U.S. Federal Census 1900 U.S. Federal Census, by Ancestry.com, ED134. Dwelling 115. [S244] U.S. Federal Census 1910 U.S. Federal Census, by Ancestry.com, ED115. Dwelling 188. Name Variation Germaine Brechtl was also known as Sister Michaeline. Name Variation Germaine Brechtl was also known as Germain. Germaine Brechtl was born in 1912 at Wisconsin. She was the daughter of John Baptist Brechtl and Margaret M. Gruber. Germaine Brechtl died in 1948 at Wisconsin. Name Variation Willard J. Brechtl was also known as Bill. Willard J. Brechtl was born on 6 May 1915 at Wisconsin. He was the son of John Baptist Brechtl and Margaret M. Gruber. Willard J. Brechtl died on 7 January 2002 at age 86. Willard J. Brechtl obtained US Social Security Card at Wisconsin; last residence Plain, Sauk, Wisconsin. Father Joseph A. Brechtl was born on 19 March 1918 at Plain, Sauk, Wisconsin. Father Joseph A. Brechtl died on 4 August 2002 at age 84 A Mass of Christian Burial will be celebrated at St. Luke Church, 1240 Nachreiner Ave. here, on Thursday, Aug. 8, at 11 a.m. for Fr. Joseph A. Brechtl, a retired priest of the Diocese of Madison who died on Aug. 4. Bishop William H. Bullock will be main celebrant of the Mass. Msgr. William A. DeBock will give the homily. Visitation will be at St. Luke Church from 9 a.m. until the Mass. Burial will be at St. Luke Cemetery. Brechtl, 84, was born in Plain on March 19, 1918, to Margaret (Gruber) and John Brechtl. He attended parochial schools in Plain and the minor seminary at St. Lawrence, Mount Calvary. He studied philosophy at St. Louis Preparatory and theology at Kenrick Seminary, St. Louis, Mo. He was ordained to the priesthood for the Diocese of La Crosse on Sept. 23, 1944 at Kenrick Seminary by Bishop George J. Donnelly, auxiliary bishop of St. Louis. He served as associate pastor at St. Paul Parish, Bloomer, from 1944 until he was incardinated into the Diocese of Madison in 1947. He served as associate pastor of St. Aloysius, Sauk City, and St. Henry, Watertown. He was pastor of St. Joseph, Argyle; St. Andrew, Verona; and St. Paul, Evansville. He took a leave of absence for health reasons in 1977 and subsequently retired. He was a member of Knights of Columbus Council 531 and the Fourth Degree Bishop William O'Connor Assembly. He is survived by two sisters: Louise Kraemer and Mary Anne Liegel, both of Plain. Name Variation Mary Anne Brechtl was also known as Marion. Married Name 6 August 1946 As of 6 August 1946,her married name was Hutter. Married Name 14 December 1968 As of 14 December 1968,her married name was Liegel. Mary Anne Brechtl was born on 12 August 1921 at Wisconsin. Mary Anne Brechtl married Anthony Charles Hutter, son of Herman Anton Hutter and Mary Rose Volk, on 6 August 1946. Mary Anne Brechtl married Raymond Liegel, son of John H. Liegel and Elizabeth Volk, on 14 December 1968. Mary Anne Brechtl died on 26 June 2014 at age 92 Mary Anne Liegel, passed away on Thursday, June 26, 2014. She was born to John and Margaret (Gruber) Brechtl on August 12, 1921. She attended St. Luke's Elementary and St. Luke's High School graduating in 1939 with the first scholarship ever presented to a student of the St. Luke’s High School. She attended Platteville University for the two year rural teacher course. She taught in Plain Sunnyside School for 3 years, the first teacher in the new public school built in 1940-1941. She then taught for 2 years at White Mound School, returning to Sunnyside for part time teaching. She married Anthony C. Hutter, August 6, 1946 after he returned from 3 years in the Air Force stationed in India. After a long illness of cancer of the throat he passed away on May 2, 1967. She married Ray Liegel, December 14, 1968. Ray passed away on January 31, 2003. She was a member and officer of NCCW, an auxiliary member of Kraemer-Jennings Post 398. She was a grandma reader at St. Luke’s Parochial School from 1962 until 2011, and a helper to the teachers. She volunteered at Kraemer Library. Her hobbies were quilting and card making. She is survived by her children, Rae Marie (Cal) Heiser , Ron Liegel, Gary (Sue) Liegel, Mary Jon (Tom) Hauge, and Julie (Jerry) McLimans; grandchildren Kelly (Moira) Heiser, Shawn (Jeanne) Heiser, Stephanie (Dave) Farnia, Katie Hauge, T.J. Hauge, Jessica (Josh Dvorak) Liegel; great-grandchildren Keira and Mariana Farnia. She is also survived by a sister Louise (Norm) Kraemer and a sister-in-law Donna (Herb) Miller. She was preceded in death by her first husband, Anthony Hutter, a son Butch, her parents, siblings, Sr. Michaeline, Willard, and Fr. Joseph A. Brechtl and her second husband Ray Liegel. A Mass of Christian Burial will be held on Sunday, June 29, 2014 at 3:30 P.M. at St. Luke’s Catholic Church in Plain. Fr. Mike Resop and Fr. Bill Nolan will concelebrate with a private burial in the church cemetery at a later date. Visitation will be held on Sunday at the church from 1:30 P.M. until the time of Mass at 3:30 P.M. In lieu of flowers, memorials may be made to St. Luke’s Endowment, Camp Hope or the charity of your choice. The Richardson-Stafford Funeral Home in Spring Green is assisting the family with the arrangements. Joseph Gruber was born on 12 January 1883 at Wisconsin. He was the son of Michael Gruber and Frances Ruhland. Joseph Gruber married Emma Alt circa 1902. Joseph Gruber died in 1938. [S250] U.S. Federal Census 1930 U.S. Federal Census, by Ancestry.com, ED34. Dwelling 79. Married Name circa 1902 As of circa 1902,her married name was Gruber. Emma Alt was born in 1879 at Wisconsin. She married Joseph Gruber, son of Michael Gruber and Frances Ruhland, circa 1902. Emma Alt died in 1970.